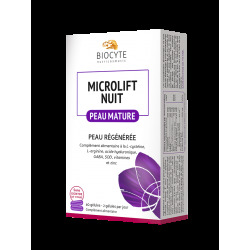 Biocyte Glycalift 45+® is an exclusive, high-tech formula, enriched with Terminalia chebula, which helps to protect cells and reduce the appearance of the signs of aging. Biocyte Glycalift 45+® is an exclusive formula for women over 45 wishing to reduce the appearance of the signs of aging. The high-tech formula is enriched with Terminalia chebula which promotes rejuvenation and anti-oxidation action and cellular protection. Biocyte Glycalift 45+® reduces the signs of aging. - TERMINALIA CHEBULA: Provides cellular protection by reducing signs of aging, promoting rejuvenation and anti-oxidation action. 2 capsules per day for 3 months. - Individuals 45 and older hoping to protect their cells while reducing signs of aging, rejuvenating their skin and providing antioxidant benefits to maintain normal skin. Food supplement with rosmarinic acid, carnosine, Terminalia chebula, vitamins and minerals. Keep out of the reach of children. Do not exceed the recommended dose. Store in a cool, dry, well-ventilated area. Dietary supplements cannot be used to replace a well-balanced and varied diet and a healthy life style.